Packaging is an important element for the success of any brand or business. From showcasing your product to its marketing, packaging can make it all possible. Like any other business, custom packaging is also crucial for cosmetic items such as Eyeliner Box. Ever cosmetic item whether it is a nail polish or an eyeliner needs special packaging to encourage customers for their purchase decision. For the time being, we will only talk about eyeliner packaging. Eyeliner is an important part of the daily makeup routine. All women love to wear eyeliner to make their eyes look big and more appealing. So, it is necessary for cosmetic brands to present their products in custom boxes. Custom eyeliner boxes can influence the perception of customers and can compel them to get the product. These boxes can market your product in an efficient way and can result in increased sales. 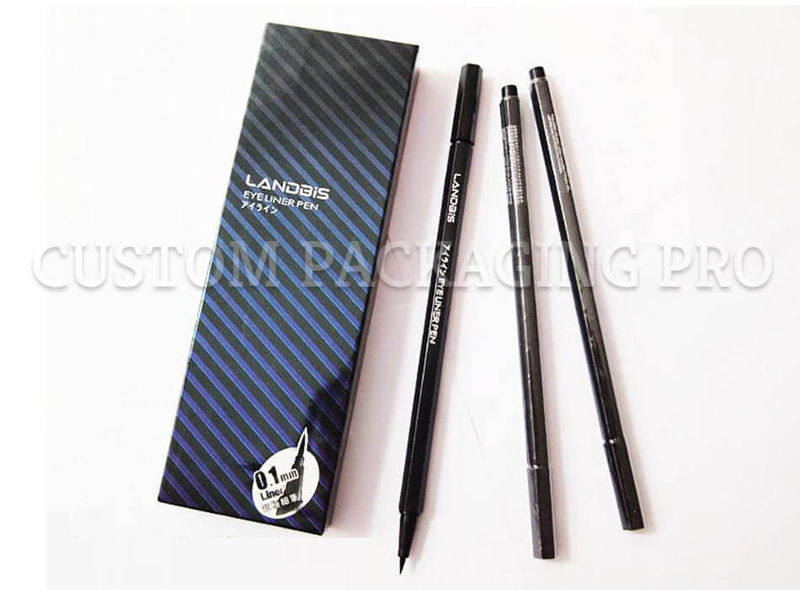 List of advantages that you can get by sing custom eyeliner box is endless. So, it is important to design eyeliner boxes for perfection. Every brand wants their packaging boxes to be unique and flawless. But There are some mistakes that can make your packaging less effective and will fail to engage customers. Whether you are selling eyeliner or any other product, it is necessary to do all things in a right way. Here are some of the basic packaging mistakes and some advice to bypass them. The common mistake which most of the brands do is opting for a box that doesn't hold the product properly. Always choose the box according to the dimensions of eyeliner. An oversized or undersized box can be un-protective during shipping and transportation. If your all products are of the same size, choose a standard size for your boxes otherwise avoid it. Eyeliners are delicate items and right-sized boxes protect the inside product and also help you to save extra cost. When it comes to custom boxes, it's all about the perception of the product. Don't over exaggerate your design or not make it complicated. If your eyeliner box does not communicate your brand message clearly, it will keep your customers wondering about the product. A box that customers find hard to connect with is the worst kind of packaging. Make your box simple and easy so, customers can easily get to know what's inside the product. Packaging should be a true presentation of what's inside. Customers usually judge the quality of a product from its packaging box. If customers will find an ordinary product in the luxurious box, what a disappointment it will be! Be certain about the box in which you are going to showcase your eyeliner products. Avoid misleading your customers at all costs. If your box will show that it holds an extraordinary when there is only an ordinary product, it will only result in disappointed customers. Packaging that stands out, market your brand and is eco-friendly will be of no use, if it fails to protect the product. You should always choose boxes that can protect the delicate eyeliner for the longest time. Strong and sturdy boxes not only prevent the product from any mishap but also increase its shelf life. If customers will receive a product that is damaged or destroyed, they will end up with nothing but disappointment. If your boxes that do not stand out or not make the product unique, you are definitely in a wrong way. Always try to add something unique to your eyeliner boxes. It can be anything the style of box, catch images, fonts or a call-to-action. Packaging which looks same as other brands will not make your product noticeable and easily identifiable. You can be unique by opting for simple and clean design for eyeliner boxes at a reasonable price. Excessive marketing is a mistake that you should avoid at all cost. We are not denying the importance of marketing with custom boxes but it can annoy your customers. Custom eyeliner boxes can be your marketing tool but limit your advertising just to brand logo and name. Make sure to put elements that can compel customers without irritating them. Two elements of branding re enough to tell customers who you are and what you offer. Nowadays, eco-friendly packaging is more than just an option. If you deliver your products in normal boxes, it can have a negative impact on your name and sales. Recyclability and reusability are the first things that people will notice in your packaging. So, always opt for 100% recyclable material for your eyeliner boxes. Finding material that is fully recyclable can be hard but you can easily get material that is 60 to 70 % recyclable. Pay special attention to every detail while designing your eyeliner boxes. So, it will be wise to get the help of a profession. Custom Packaging pro is a leading packaging company which provides you lots of option for customizing your boxes. Choose us if you want to make your brand and product a success.